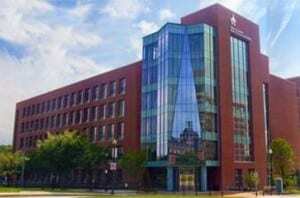 We are located on the 6th floor of the state-of-the-art, 207,000 sq ft Robert H. and Clarice Smith Building of the Wilmer Eye Institute on the Johns Hopkins School of Medicine Campus in Baltimore, MD. The first floor is dedicated to eye surgery, and the top five floors are dedicated to research. The open floor plan enhances everyday interaction among its more than 350 inhabitants, including basic scientists, biomedical engineers and clinician-scientists. We thank our donors for their tremendous support. It is this type of generosity that allows us to develop nanomedicine and move these technologies from bench to bedside. If you are interested in joining the community of supporters, please complete the form below for more information.